Amelior is pleased to invite you to the first Social Market this spring on Saturday, April 18, from 8 am to 6 pm at the La Noue in Bagnolet. In concert with the Guy Tofoletti Social Centre, which has been supporting the neighborhood for 30 years, we are inviting many associations devoted to recovery recycling and solidarity to present their activity to the general public and share a friendly get-together day. In particular, the Biffins of the AMELIOR association will be displaying their second-hand items, transforming the entire neighborhood into a big market. 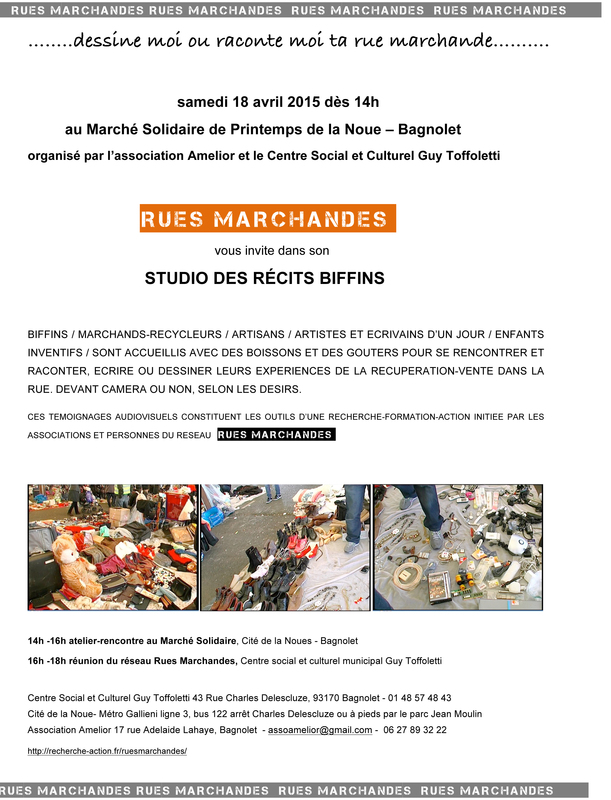 In keeping with previous experiments and measures implemented in the 18th and 14th districts, as well as in Montreuil, and which, since 2009, are designed to foster the inclusion of waste pickers by organizing social markets, the city of Bagnolet allows Biffins who members of AMELIOR to access and revitalize the public space. In June 2014, the association had participated in the La Noue Street Festival, where Biffins were allowed to have a booth, and had seen the important role played by the network of associations and local initiatives in the revitalization of this enclosed space with a dense, relatively young population. Read full article in French.